The #1 Selling Comic of 3006! 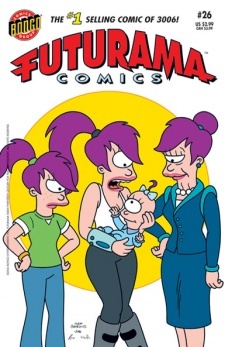 "A Whole Lotta Leela" is the twenty-sixth comic issue, which was released 26 July, 2006 in the US. Bender has signed up for a course in alien weapons repair, and the school sends him a new weapon each week to repair. Meanwhile Leela is depressed that she won't be able to find a man and eventually gives up on dating. Bender attempts to use a time rifle on the Professor but it malfunctions and explodes, splitting Leela into her baby, teenage, elderly and modern years. Leela has to look after them all to avoid changing her past and future, but it turns out to be too hard, such as teenage Leela getting a nose ring which causes modern Leela to get one as well. Modern Leela decides to walk around in her bathing suit since Teenage Leela threatened to get a tattoo (so if the teenager gets one, Leela will know straight away). One day, Fry and Teenage Leela go out for a meal in a cafe, where Teenage Leela says she has a crush on Fry. They receive a call from Professor Farnsworth, telling them the space/time continuum has ripped, causing younger and older versions of themselves to appear at Planet Express. The Professor is too scared to try and fix Bender's gun to send the alternate reality versions back to their own times. Elderly Leela makes out with the Professor, in hope of giving him some inspiration to fix the gun. It does, and all of the other versions of the crew are sent back to their own time. Bender receives a new gun to repair, which has the power to end the world at the press of a button. Bender accidentally drops the gun, causing it to activate, to which we are submitted a plain black panel which reads "THE END" in white writing. Morbo hosts the alien firearm repair commercials. The ending suggests the world was obliterated by Bender's clumsiness. On the opening (splash) page, Fry is a giraffe, Amy is a kitten, Zoidberg is a hippopotamus, and Leela is an octopus. Leela's form may be in reference to one of her mother's mutations. First and most likely the only appearance of Rick the second intern. Leela was able to get a "How to speak French" mp3 despite French being a dead language. The younger versions of the Planet Express crew is a callback to "Teenage Mutant Leela's Hurdles". Rosie from The Jetsons is seen. The title is a reference to British rock band Led Zeppelin's song, Whole Lotta Love. The Robot Accountant is built to look evil. It's all to convenient for him to want to turn evil while already looking it. This page was last edited on 13 February 2015, at 09:05.